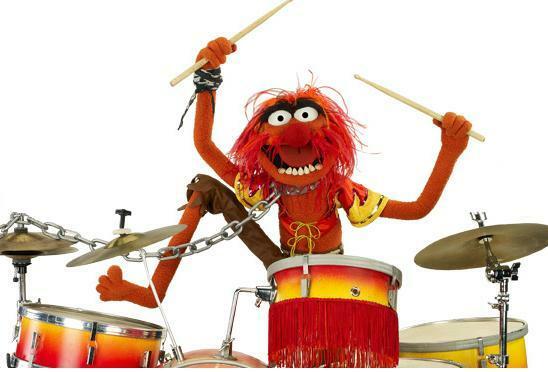 Teaching yourself drums is a great way to learn Animal’s technique…or lack thereof. “Learn How to Drum Like a Pro in 10 Easy Steps”. Sure, it’s drumming – how hard could it be anyway? All you need is a video and a drum kit and you’re ready to go, right? Sure, if you have no aspirations to learn how to play drums. The truth is that those videos are often devoid of substantial content and fall short of teaching the eager student. Having said that, it is not always “wrong” to use videos – there is a time and a place in your musical development that it is more appropriate. It’s obvious that a video cannot provide hands-on correction. Try as they might, the student cannot perfect their position, posture, and technique by watching a video. When these fundamental elements are compromised, the student can develop a long list of bad habits and sloppy traits that will be very difficult to unlearn. Essentially, they’d have to start over again and then what is the point of the short cut? In live drum lessons, the teacher helps students get their hands in the right position, ensures that the student is using more wrist than arm, and makes sure that their posture is good. or see their total posture. Consequently, the student might learn something incorrect, and we all know that unlearning and relearning is much more difficult than learning right the first time. Drum videos tend to be more generalized. They are not tailored to the needs of the student, and they move quickly through the basics. They promise to “Learn Drumming in 10 Easy Steps” but the reality is that they skip, omit, or gloss over important lessons. After a video, you learn how to mimic, not how to master your drum set. If you are an advanced drummer who has learned drum theory and foundations, then some of the advanced videos out there are just fine. These advanced videos tend to focus on different techniques and styles versus the basics. Caution: don’t skip ahead to these videos if you’re new. You’ll never be able to “Drum Like Neil Peart” without professional fundamentals – even he would tell that. With private drum lessons, you have the benefit of personal instruction, tailored specifically to you. The personalized aspect means that they understand your goals and have created a custom plan that works towards those goals. They will work with the specific style and rhythms that you want to learn, and incorporate other essential drum techniques that will boost your learning, as well as drum notations. A good teacher will provide demonstrations using a drum set you are familiar with and will closely monitor your progress as you practice what you learn, correcting technique, movement, style, and position as you go. With an instructor, you can set goals and meet them, which is an important motivation tool. You also have someone to be accountable to. No video is going to help you pick out a drum set or talk you up when you’re frustrated and ready to quit. It goes without saying that drum lesson videos can’t connect you with other musicians or gigs in the area. There are no student showcases or other performance opportunities, and believe it or not, learning to perform actually takes a little bit of learning itself – better to get that out of the way during student concerts instead of your first big gig. The drummer on a video might be self-taught or might have picked up a few bad habits themselves that they are about to pass on to the student. Not to say that any drum teachers are perfect, but when you go to a school you get more assurance of the quality of the teacher. You can look at reviews, ask other students or parents, and talk to the school about the qualifications of the teacher. At Elite, for example, we look for drum teachers who have a background not just in drumming, but one of a formal education and experience teaching. The conclusion is clear and simple. If you want to learn how to play drums well, you it is better to take drum lessons with an informed teacher who can keep you on the straight and narrow during the most critical period of learning. Once you’ve leveled up to advanced, it’s okay to check out some of the techniques and styles of your heroes via video.